Cooper University Health Care was proud to host the New Jersey Department of Health’s Human Papillomavirus (HPV) educational kick-off meeting as part of its Partnering for a Health New Jersey initiative on January 31, 2019. A panel of experts, including physicians from MD Anderson Cancer Center at Cooper, discussed the epidemiology of HPV infections, current immunization coverage rates, and key steps toward prevention. Read more. 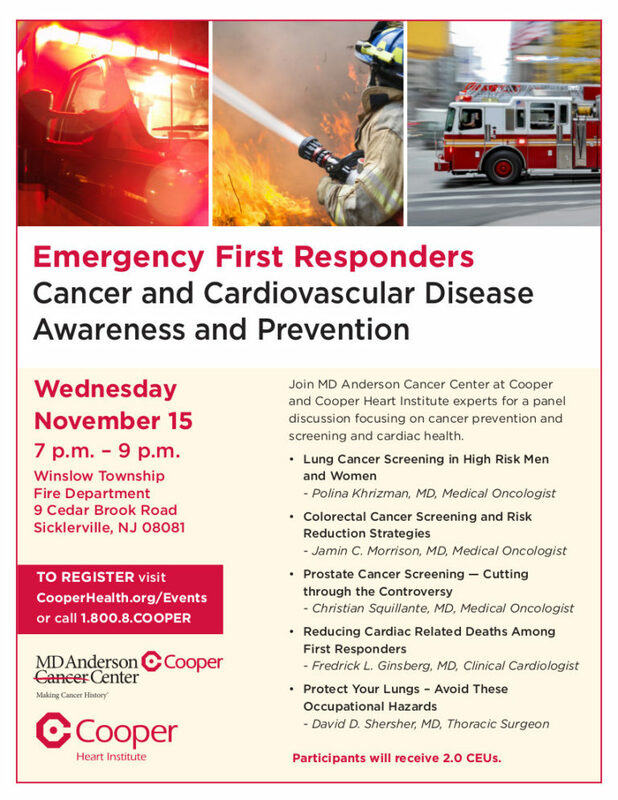 Join MD Anderson Cancer Center at Cooper and Cooper Heart Institute experts for a panel discussion focusing on cancer prevention and screening and cardiac health. Free blood pressure screening will be offered starting at 6:30 p.m., the program begins at 7 p.m. Two (2) CEUs will be provided for attending this event. Read more. On Thursday, September 29, 2017, Cooper specialists joined WIP on-air personalities Glen Macnow and Ray Didinger at the PJ Whelihan’s in Maple Shade for “Men’s Health Playbook,” a panel discussion on cardiology, men’s sexual health, prostate health, sports medicine, urgent care, and vascular health. Attendees heard from Cooper experts James J. Flowers, DO, Frank W. Bowen, III, MD, Christian Squillante, MD, Lawrence S. Read more. Steven T. Kaufman, MD, division head of Endocrinology at Cooper University Health Care, has been appointed medical director for the health system’s Urban Health Institute (UHI). Cooper’s Community Health Department kicked off their day with a visit to the Collingswood Fire Department to give cardiovascular screenings and comprehensive risk assessments to our community’s local heroes. Thank you to our local heroes for all they do for our community! The mission of Cooper University Health Care is to serve, to heal and to educate. Within Cooper’s community health outreach, the goal is to promote healthy behaviors and preventative care in collaboration with community partners. Read more.